See the Royal Albatross, Shags, Little Blue Penguins and other surprises. 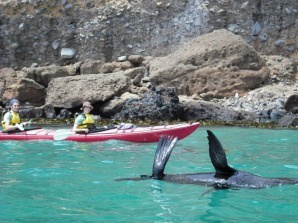 Our Cruises and Kayaking trip goes from Wellers Rock and to Taiaroa Head to see the wildlife. Discover New Zealand’s only Castle, built 1871 by William Larnach, for his beloved first wife Eliza. Discover the Maori and European occupation of the headland with a visit to the 'Fort Taiaroa' fortifications beneath the Albatross Colony. Unrivalled viewing of Northern Royal Albatross, Seals, Penguins and up to 20 species of bird and marine life in it's natural and otherwise inaccessible environment.